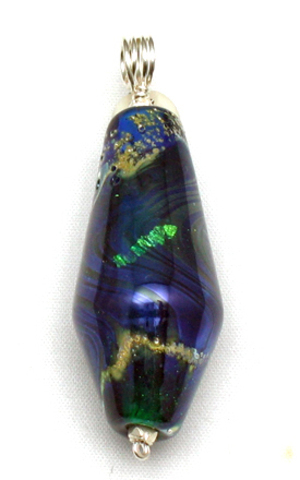 This offset bicone shaped lampworked bead combines pure silver foil with intense blue, Triton, and Gaia glass. The components were added one at a time to form a round ball. The next step was to hold the stainless steel rod on which the bead was formed vertically while heating the glass to a sufficiently molten state to allow it to flow along the rod. Very subtle patterning developed as the glass flowed. Thanks to Lara Lutrick for sharing the technique.